A Russian jury has found five ethnic Chechen men guilty of murdering leading opposition politician Boris Nemtsov. Zaur Dadayev shot the former deputy prime minister, a vocal critic of President Vladimir Putin, in February 2015 near the Kremlin. Four others acted as their accomplices. The group were allegedly promised $250,000 (£192,000) to kill Nemtsov. They all denied the charges. Nemtsov’s relatives fear that whoever ordered the murder will never be found. 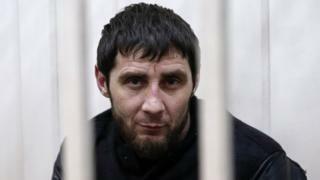 Russian authorities are still looking for another Chechen said to be behind the killing, Ruslan Mukhudinov. He believed to have fled abroad. But lawyers for Nemtsov’s family have said the investigators have exaggerated Mr Mukhudinov’s role and “the masterminds are high-ranking people”. The jury in Moscow convicted the five men after more than eight months of hearings. Zaur Dadayev is former member of an elite military unit. He was under the command of pro-Moscow’s Ramzan Kadyrov, the head of Russia’s Chechen Republic in the North Caucasus. The other four defendants are brothers Anzor Gubashev and Shadid Gubashev, Ramzan Bakhayev and Tamerlan Eskerkhanov. A sixth man, Beslan Shabanov, died after he was detained in Chechnya. Nemtsov served as first deputy prime minister under President Boris Yeltsin in the 1990s, and later became a vocal critic of President Putin. The 55-year-old was shot dead on 27 February 2015 on his way back from an interview with a liberal radio station, in which he had called on listeners to join a rally. At the time, Nemtsov was working on a report examining Russia’s alleged role in the conflict in Ukraine. President Putin called the murder “vile and cynical” and vowed to hold those responsible to account. Russia has seen several killings of high-profile politicians and journalists in recent years. But the country has a long history of prosecuting alleged hit-men and failing to follow the chain of command to discover who ordered the murder, correspondents say. After about 12 hours of debate the jury returned with a clear verdict – they found all five men guilty of murdering Boris Nemtsov, and by a clear majority. In a glass cage, the men listened in silence – with the occasional smile – as the decision was read out. The wife of one of the defendants broke into tears. This was the murder that shocked Russia, a prominent critic of President Putin shot in the back right besides the walls of the Kremlin. Once a political hi-flier, Nemtsov had been sidelined under Vladimir Putin. But he remained a loud voice of protest in Russia. Nemtsov’s family are sure that’s why he was killed. But this trial focused only on the contract killers, without asking who hired them and why.